No wallows in the slime." Offered as a partial demonstration that I was quite a wit in my youth. Whatever happened to me? And it occasions the arrival of another feature that riffs on the night of Dec. 8, 1980, when Lennon was murdered. This newcomer, THE LENNON REPORT, re-enacts in moment-to-moment fashion (not real time, but close) the events unfolding around emergency first-responders, police and media in New York City on the night the baby boomers lost one of their idols. I was expecting a whiff of exploitation in this obvious modest-budget enterprise. But director Jeremy Profe’s presentation is a fairly respectful one. 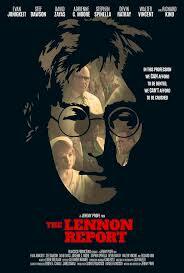 At least I liked it a bit more than I did CHAPTER 27, even if it does seem another trip too many to the Lennon-memorial well. The crime itself is not shown. We meet the police who first found Lennon, bullet-riddled and unresponsive by the Dakota Hotel; the officers bring the musician to a NYC hospital themselves (a nearby ambulance being a mysterious no-show), slowly realizing who it is. There are the doctors who do their best (a grueling 30 minutes of heart palpitations) to try to save Lennon on the operating table. There’s Yoko Ono (Karen Tsen Lee), summoned to the ER and waiting, stunned, for the outcome. Perhaps most notably is the fluke presence of Alan Weiss (Walter Vincent), an ABC broadcast-news producer, who just happened to be in the same emergency room that night after his motorcycle gets run off the road. From his gurney he sniffs out the presence of a VIP casualty just a few feet away and struggles to get the news to his colleagues on the outside. It is a little discomfiting to see this bit, as ABC journos seem more engaged by the career-enhancing prospect of scooping the competition than any sorrow about the homicide. Only one of the young doctors seems to be emotionally shaken out of his job-performance zone to realize that this is an icon he’s losing. A certain Rick Crom plays Howard Cosell, handed the bulletin during a tense Monday Night Football finale. And, yes, there is not a big-name marquee-value actor in the ensemble, which is all to the good. Nor are there any overt conspiracy theories (except that one surgeon might have hogged all the publicity over his presence in the OR), even though the Alan Weiss segment, with the borderline-annoying newshound carrying on as though he’s fated to rip the lid of a major coverup, sort of impinges on that – as does an opening audio montage of life in Ed Koch NYC in this period, with gun violence escalating, the Ronald Reagan regime in Washington promising an end to liberalism and throwing the treasury to the military-industrial complex, and Cold War with the USSR heated up with the likely Russian invasion of Poland. Lennon’s give-peace-a-chance outlook, it’s suggested, won’t stand a chance during this administration. In the end we see the real-life individuals portrayed onscreen (minus Yoko and a few others), most affirming what we could divine from the script, that whatever they felt about Lennon personally, they all did what they could do to try to rescue him that night just as they would have any other anonymous victim of the epidemic Big Apple street horrors of those pre-Guiliani days. Overall, THE LENNON REPORT comes across more akin to the type of film represented by Paul Haggis’ CRASH; people from different, seemingly random walks of life brought together by sudden tragedy. And if there’s a bit of a sense of aging-boomer self-absorption and celebrity-worship, oh well.